Stylish and adorable. Just the thing to go with all that alcohol, although these guys have such haughty expressions I think they might be judging me if I used them for their intended purpose. 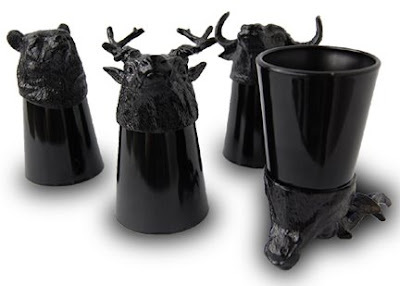 Black shot animal glasses with carved pewter heads from Goody Grams via Generate. I was psyched last Christmas when my bottle of Jagermeister came with something like this; it was made of pewter and had the stag head.